The bulk of our childhood memories are the stuff of legends. They are composed of blurs of things we saw tainted by responsive feelings and contained by the witness of the powerful other, parents, grandparents or older children, all more reliable testimonies than our own. However, it is these memories that forge our personality and impress us at our most influential stage of life. Is it possible to truly know your family outside of their role in our lives? Do we know our families the most or the least out of all the people we meet? How often are we wounded by the things we didn’t know about our parents and grandparents, baggage passed down through generations like a birthmark or an heirloom? These are the questions at the core of Olivia Satchel’s desire to get to know her grandmother, a woman she never met, but whose life influences her own every day. My Name is Truda Vitz is the recreation of a fictional life from snippets of knowing, feeling and observation that Ms. Satchell pieces together from the various family legends, photographs, rumours, and country histories floating through the last two generations.. She only knows her grandmother, a woman who died before she was born, through her father Paul, and it is by traversing the complex terrain of father and daughter that she manages to piece together something of what life was for her grandmother, a remarkable woman who fled Vienna and almost certain persecution for being a Jew. By hobbling through dates: British citizenry, marriage, children’s births, Olivia creates a skeleton of happenings, fleshing them out with anecdotes, likelihood and intuitive awareness. In this small way, she forges a bond with a woman whose facial features, relatives, genetics and legacy she shares. 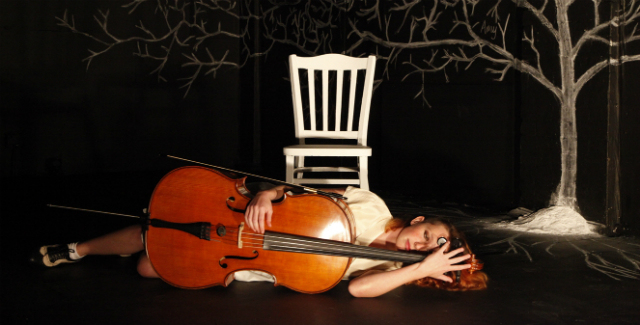 This simple tale of one woman’s quest to connect with someone so important in her life whom she never knew is a gentle, lilting piece of theatre made striking through extraordinary lighting effects and the pure resonating sound of Olivia Satchell’s cello. She stands alone to tell her story, her fathers story and that of Truda Vitz in front of an enormous white tree that will change colours through the talented lighting work of Benjamin Brockman and designer Isabella Andronos. It’s a family tree but it also reminds the audience of the reaching of Olivia Satchell herself as her deep exploration travels along the branches of her own history. Her tale is told simply and moderately, her self-consciousness taking centre stage as she informs the audience she is first this character from her past and now this character from her past. She is directed by Pierce Wilcox who keeps movement to the simplest of associations with the audience, emphasising Ms Satchell’s ability to connect with intimacy as she tells her tale. My Name is Truda Vitz ends up being an enthralling hour of watching one woman tell her tale without ever being overwhelmed by the substance and building blocks of narrative. This is always Olivia Satchels tale, and we are always reminded of that, constantly in the present while reaching for the past. My Name is Truda Vitz is a haunting piece of theatre that will reamin you for days after.